The Measure of Your Life! Don’t let the measure of your life, be just 6ft! Think about what that statement means for a moment? Many people in life, don’t even know why they are here? Most individuals don’t know their purpose in life? So many people arrive into this world and leave without a trace, that we didn’t even know they were here. Ladies and Gentleman, the richest place in the world today for people’s ideas, dreams, ambitions and life’s goals, is the graveyard! We get caught in the rat race, the majority of people in the world sit in the same traffic every day, go to work at the same place they hate with people they can’t stand. They get paid far less than they are worth but just enough to stop them quitting. Then they sit through the same traffic again going to a place called home to watch TV and go to bed. The very next day, they do the same thing over and over again until the age of 65 and for what, to get an alarm clock and a rocking chair for all their years of service. My father was like that! He worked 32 years in the same organisation, working 8 to 10 hours a day which, I called “Doing Time” he called that “life” I called that “waste” His goal was to just clear his mortgage by the time he was 65. When my father retired, he received a pension for £44.65 a week and his radio alarm clock which I still have to this day as a reminder that, that would not be me. He only lived to see his pension for 4 years before he died. His whole life worked for only £9287.00. My father made what’s known in life as a settlement. A bit like when you settle out of court, you do so because you don’t believe you can win. My mother was the ambitious and driven one; she always strived for the best of everything and refused to let anything stop her from achieving her goals. I remember that when she was diagnosed with cancer, I spent the best part of 2 years of my childhood in one hospital to the next until she died. One thing I noticed about my mother, even though she was terminally ill, she never gave up the will to live, she kept working hard to provide for me and my sister to ensure we still had the best of everything to the very end. Most people don’t know how to live until they are told they only have months to live, they know deep down in their hearts that they are destined for bigger things, but fear gets in the way. The difference between my mother and father was, that my father was too afraid to aim high and miss that he aimed too low and hit. From seeing this, I say to everyone, never underestimate yourself, you have greatness within you, aim for the top, as it’s the bottom where it is overcrowded. We are all born for a purpose, we were chosen for a reason. That reason is not just to pay a mortgage. 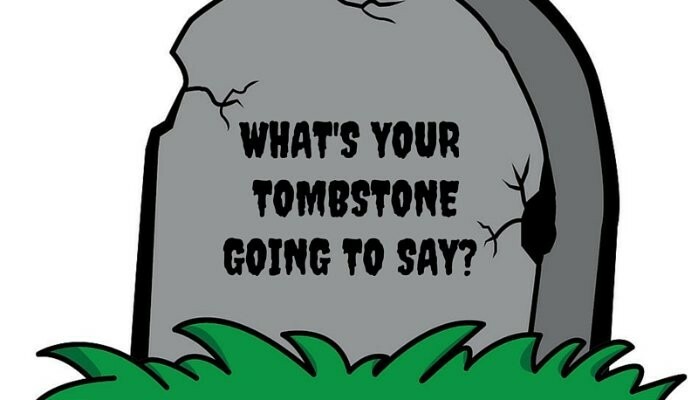 Ladies and gentleman, what is your tombstone going to say?